An Post says they are confident that the 144 missing match tickets for the game against France have not fallen into the wrong hands as prices for the sold-out game soar. An investigation is underway after 144 match tickets for the RBS Six Nations game on February 14 were "lost in transit". 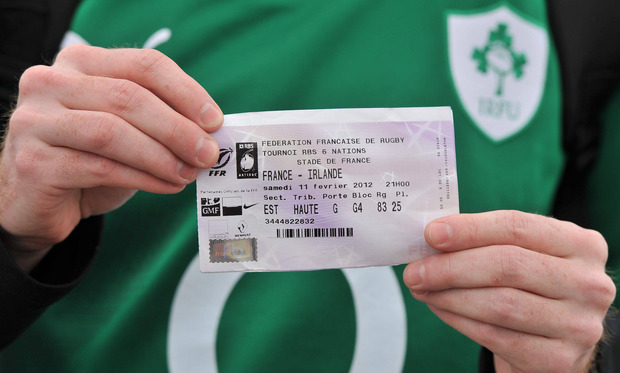 The Irish Rugby Football Union (IRFU) is advising fans looking to avail of tickets for the sold out Ireland-France encounter on February 14 not to buy tickets off unofficial sellers. The IRFU will cancel the lost tickets and have reissued them to the clubs they were originally destined for. It is believed that seven packages containing the 144 tickets went missing during delivery, but it is not believed that the tickets have "fallen into the wrong hands". An Post said it is investigating the incident as a matter of urgency. "An Post is working with the IRFU and Ticketmaster in respect of seven registered mail items which appear not to have reached their destination," the spokesperson said. "Replacement tickets have been issued to the affected customers and while there is no reason to believe that the outstanding items have fallen into the wrong hands, the IRFU have taken the opportunity to remind rugby fans never to buy tickets from unofficial outlets," An Post added. Although Ireland's Valentine's Day affair with France is sold out, tickets can still be bought on 'marketplace' sites. London based company Viagogo is offering tickets for the match with prices ranging from €120 to €1,606.52 for a seat in the Premium section. The site provides fans with what it describes as "a safe and secure platform on which to buy and sell tickets". On DoneDeal, premium tickets are on sale for €400 each, while a pair of tickets for the South Stand is available for €360. Last year, English out-half Owen Farrell found himself at the centre of ticketing controversy after a ticket reserved for him turned up on the Viagogo website for 600pc its original value. The £70 ticket for last year's Ireland-England encounter at Twickenham was meant for the friend of one of Farrell's relations, but ended up being sold on the website for £440.